Spinal Decompression Therapy is FDA-cleared and has been clinically proven with a very high success rate for pain associated with herniated or bulging discs…even after failed surgery. This revolutionary therapy treats several conditions involving your spinal column and discs. It is a non-surgical, decompressive therapy for the relief of back and leg pain or neck and arm pain. During this procedure, by cycling through distraction and relaxation phases and by proper positioning, a spinal disc in the neck or low back can be isolated and placed under negative pressure, causing a vacuum effect within it. Anyone who has back pain or neck pain caused in whole or in part by a damaged disc may be helped by spinal decompression therapy. These conditions include herniated, protruding or bulging discs, spinal stenosis, facet syndrome, or arm or leg pain/numbness. Are the Spinal Decompression sessions painful? Since treatments are individualized for the patient, the number of sessions can vary. However, our doctors typically recommend 20 sessions in order to achieve the best results. Most certainly! One study documented by MRI up to 90% reduction of disc herniations in 10 of 14 cases! Other studies have reported that the majority of ruptured disc patients achieved “good” (50-89% improvement) to “excellent (90-100% improvement) results after spinal decompression therapy! How does this negative pressure affect an injured disc? The vacuum effect accomplishes two things. From a mechanical standpoint, disc material that has protruded or herniated outside the normal confines of the disc can be pulled back within the disc by the vacuum created within the disc. Also, the vacuum within the disc stimulates growth of blood supply, secondarily stimulating a healing response. This results in pain reduction and proper healing at the injured site. How is Spinal Decompression Therapy different from regular traction? The new DRX9000 True Non-Surgical Spinal Decompression System is the key. It offers patients a much more customized treatment than regular traction. The DRX9000 uses data retrieved (several thousand times per second) from its servo-motion system and constantly feeds it back into the treatment computers. This controls any variations in therapy to ensure proper spinal decompression treatment. The DRX9000 system differs from regular traction in this way by eliminating muscle guarding that is typical in conventional traction devices. It also allows for higher levels of spinal decompression and disc rehydration. Is Spinal Decompression right for you? 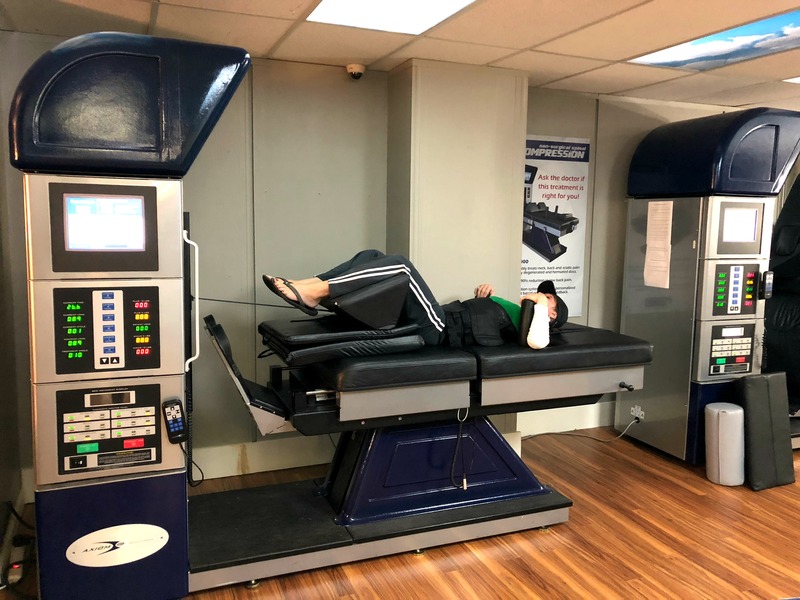 If you are suffering with a herniated disc in your neck or low back – or know someone who is – then Spinal Decompression Therapy should definitely be considered. For additional information, please call our Nashville Spinal Decompression office and ask to speak to one of our doctors. That’s right, we’ll talk to you personally in order to help you determine if this treatment is right for you.